We don't make your home, WE make your home better! The Green RESNET Video tells All! 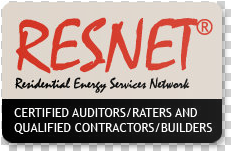 The Residential Energy Services Network (RESNET) was founded in 1995 to serve as a non=profit Organization that empowers homeowners to reduce the cost of ownership by reducing Utility Bills and improving the efficiency of their homes. EnergyRatingService.Org, is an organization that belongs to RESNET and follows the RESNET guidelines to effectively help the homeowner use the HERS rating system. We have completed the rigorous training to qualify as RESNET Certified HERS Rater. Contact: Art Carlson, Engineer, Rater, Verifier: Art@EnergyRatingService.org or 855-820-Rate (7283). We are proficient in guiding the Architect, Contractor, Builder in using the Path of least Resistance, whether Building New, remodeling or adding. Much has been made of the Energy restrictions when building custom residences, Energy Rating Service simplifies the Options and the path choices. The objective is to Build Smart, Use afordable building science, and optimize over all costs, with lower costs of ownership. As the saying goes..." Price is what you pay, Value is what you get". Energy Rating Service is the Builders advocate, You know how to build, we know how to submit, establish the right path, stay with it, and meet or exceed the Energy Targets. Blower door and Duct pressure testing, Easy to do! The County asks for < 7 Air changes per Hour (ACH50) when the building is pressurized or depressurized. Remember If you do not measure it, you can not change it. This tool goes a long way to lowering energy losses. Take a look at RESNET'S Consumer HERS index page. In 2007 the National Association of Home Builders (NAHB) and the International Code Council (ICC) partnered to establish a much-needed and nationally-recognizable standard definition of green building. The resulting ICC 700 National Green Building Standard™ is the first and only residential green building rating system to undergo the full consensus process and receive approval from the American National Standards Institute (ANSI). The Standard defines green building for single- and multifamily homes, residential remodeling projects, and site development projects while still allowing for the flexibility required for regionally-appropriate best green practices. Certification to the standard is provided by the NAHB Research Center. Copies of the Standard, a companion commentary, and other publications related to the Standard can be purchased online . A free Green Scoring Tool compatible with the standard is available on the certification side of this website. For residential buildings, four threshold levels - Bronze, Silver, Gold, and Emerald - allow builders to quantify and qualify green building at all levels. At the Emerald level, the highest rating for a residential green building, a building must incorporate energy savings of 60% or more.